In the one good scene from an otherwise abysmal 2015 Vacation retread, Ed Helms, playing a grown-up Rusty Griswold, visits his parents’ bed-and-breakfast in San Francisco. He and his wife and kids need a vehicle to finish their cross-country trek to Walley World, and Clark Griswold, played by Chevy Chase, offers to lend Rusty his car. They go to Clark's dual garage. Clark hits the key fob, and as the door opens the audience sees... a Nissan Altima. “Whoops, wrong door,” Clark says. He and Rusty move to the other one and slowly it rises until there it is: the Wagon Queen Family Truckster, that “metallic pea green,” faux-wood-paneled monstrosity, still as ugly as it was in the original Vacation, 32 years earlier. That Truckster stands in for all the misbegotten eyesores ever manufactured, and the “wood” paneling is its most damning feature. Rightly so. By the time the first Vacation came out, fake wood had become a joke, a onetime status symbol that had been degraded to suburban kitsch by decades of reckless, tasteless overuse. 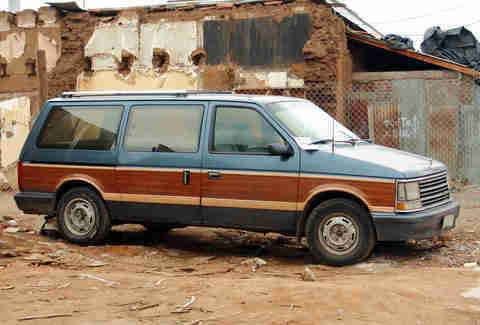 To this day, I can't see a woody without thinking about all the real-life Clark Griswolds who owned them 30 years ago. In my mind they are slumping middle-aged men selling insurance out of grim office parks for bosses who belittle them; rolling down the windows after work to air out the stench of day-old fast food; returning home to wives who frankly expected more out of life, and kids who aren't as bright as their fathers had hoped. And amid this catalogue of insults and humiliations, we have that wood paneling -- once thought to convey rugged sophistication, and now operating as a cruel running commentary on the life and withering dreams of its owner. Too dark? Maybe. But a generation after this totem of poor taste was laughed into extinction, something strange happened. The woody came back. It's been 25 years since a wood-paneled vehicle was mass produced, and yet a Ford Country Squire graced the cover of a recent L.L. Bean catalog. A wood-paneled Jeep Grand Wagoneer appeared in a Tommy Hilfiger ad. For those so enchanted, Ford's Flex crossover now comes in wood, and Jeep, due to pent-up demand, strongly hinted that it would bring back the Wagoneer and its faux wood in 2018. Why is this happening? Ironic nostalgia? An unholy union of the born-again preppy and the urban woodsman? #TBT infecting the world of automobiles? To find out, I spent a few weeks reading up on woodies and talking with their owners and the people invested in their comeback to try to figure it out. And I'm here to tell you, after years of gratuitously dumping on the woody and those who drove them, I'm ready to admit an error in judgement. I'll go even further. I think we should all, sincerely and unequivocally, praise the woody. Here's why. The first thing to understand is that the wood-paneled car used to signify luxury. The earliest vehicles, which only the wealthy could afford, often came wrapped in a wooden body, a vestige of the carriages from which they'd evolved. This was real wood, too, birch or mahogany, which could be bent under steam or pressure. In 1916, Dodge debuted a car with an all-steel body, but for the next 40 years, wooden models were manufactured even as steel ones overtook the market (including the 1940 Ford identified with The Beach Boys). By the 1950s, a “wooden” car was one that featured wood paneling along the doors; the rest of its body was metal. 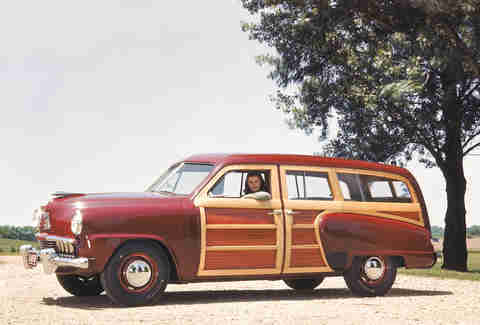 Even after Buick and its Estate Wagon abandoned real wood in 1954 -- the last car to showcase it, because for years the wood had warped after exposure to the elements -- makers continued to manufacture vehicles with faux-wood paneling because they sold at a price roughly 30-percent higher than the average model. “Woody wagons,” the editor of Classic Car History wrote, “were first popular in affluent American communities, and were often found at hotels, country clubs and national parks.” Ads from the post-war era -- hell, even the names of the cars themselves (the Ford Country Squire?) -- always returned to the same theme: You are buying status. Even Jeep got in the act. A print campaign around the deluxe wood-paneled Wagoneer carried the tagline: “The most elegant four wheeler ever crafted.” Jeep was suddenly a long way from the swamps of the Pacific theatre, where the vehicle debuted in World War II. Back then, there was something romantically American about the woody. The European luxury cars of that era were sleek and seductive, an aesthetic that embraced if not defined modernity, but also reinforced the old class distinctions. (Just look at these Benzes from 1968 and tell me they were meant for anyone other than the haute société.) The luxurious American woody, by contrast, was more egalitarian, longer and squarer than its European counterparts, sure, but with a design -- that faux-wood -- that nodded to our frontier heritage. The look embodied the mood of a nation then embarking on a sort of second Manifest Destiny, venturing beyond their cities to settle in newly built suburbs connected by newly built highways plied by newly built cars running on cheap gas. America was changing, and the woody became an emblem of a shared post-war optimism and mobility in all its many forms. The Jeep Wagoneer in particular benefited from this cultural understanding. It was a perfect fit, a vehicle as rugged and refined as its owner believed him- or herself to be. It looked like it was made for entrepreneurial titans in Denver or San Francisco on their weekend jaunts. 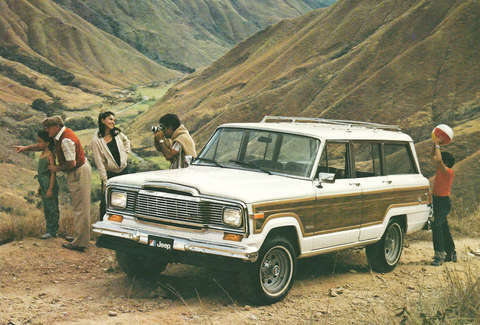 With room for eight and a detailed wooden trim that blended well with its forest color scheme, the Wagoneer transcended its own marketing and showed Americans -- a generation before the Escalade -- that style wasn't limited to sedans. And long did it reign. Consumer Guide recently called the vehicle's 30-year run, from 1963 to 1992, the “gold standard” by which all SUVs will be judged. So how did we go from that to the Wagon Queen Family Truckster? Some of it had to do with the oil crisis of the 1970s, which forced manufacturers to make more fuel-efficient cars, which in turn shortened the lengths of their bodies. The boxier sedans just weren't visually stunning, and no amount of aspirational advertisements could help. For instance, there is nothing Regal about this Buick. Throwing some fake wood on the side only made it worse. 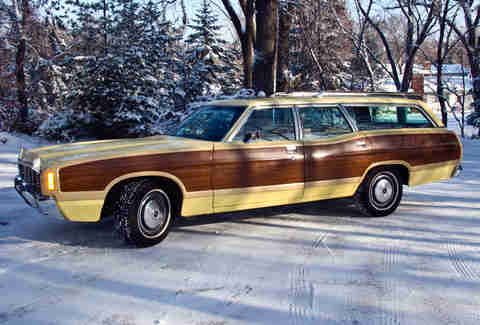 And the station wagon market in particular seemed to prefer an aggressive ugliness in its woodies. The name had only a casual relation to geography... The wood part was spurious since... not a tree stood over 10-feet tall or as thick around as my father's thumb. The houses, with a few exceptions, were boxy split-levels, clad in asphalt shingles of various colors, with two windows above a gaping garage door, affording the façades an aspect of slack-jawed cretinism. By the late '70s and early '80s, the first generation of suburban kids came of age, and they rejected their parents' tastes and particularly their suburban status symbols. Everything was fake, and nothing was faker than the fake wood paneling of a car that was not only aggressively ugly but also somehow still on the market. The Wagon Queen Family Truckster is in almost every scene of the original Vacation movie -- but does not appear in Hughes' short story, from which he adapted the script. 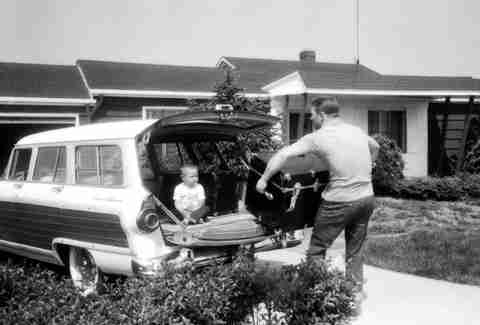 (In the original, the family travels across country in a 1958 Plymouth Sport Suburban, which wasn't a woody.) Hughes never commented on why he switched it, but Harold Ramis, the director of Vacation, said he wanted a car “deliberately detailed in bad taste.” Ramis was one of those kids raging against the false promises of the 1950s, and his green beast, as with all good comedy, showed society the depth of its poor judgment. 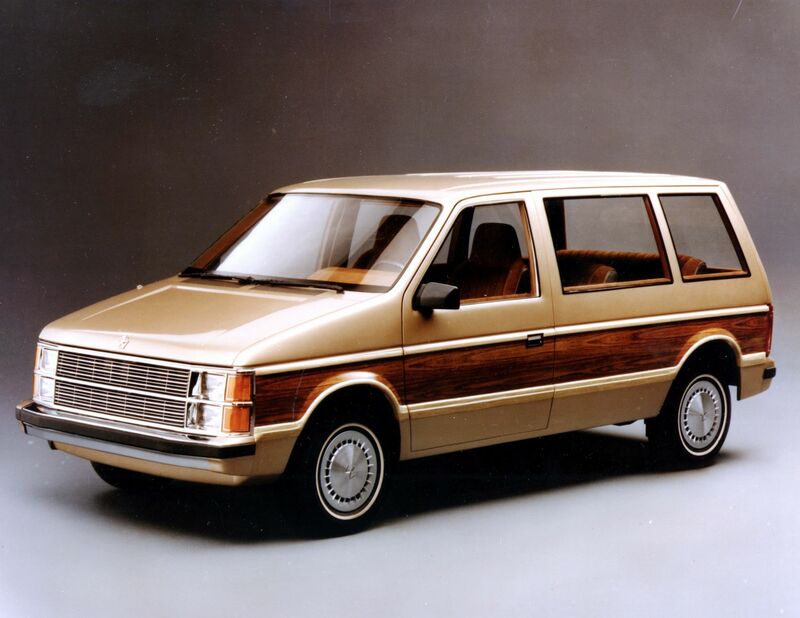 By the early '90s, about the only mass-manufactured woody left was the Wagoneer, and Jeep dumped that when it introduced the sleeker Grand Cherokee in 1993. The PT Cruiser, itself a nostalgia play, offered a woody option, but that came and went. All things die, as all things must, but when you consider that Karl Benz invented the motorized bus in 1895, launching an industry, the woody, in some form or another, lived for nearly 100 years. Spinners wish they had that sort of longevity. Our story should end there, the once-striving woody dispatched by a changing world, bad design, and good comedy. But these things are oddly resilient. This interest runs deep among millennials, marketers find. It's why record sales are up year over year, why crafts and artisanal movements are huge, and why we had to contend with the aforementioned urban woodsman for pretty much a whole decade. There is an earthy earnestness to today's pop culture, which is not only a rejection of Gen X's sneering cynicism but a nod to a DIY optimism, which last ruled during the heyday of the woody. If you add in the nostalgia of Millennials' parents -- Jeff Kobs at Wagoneer World says a number of his clients grew up in a woody and want that experience for their kids -- you begin to understand why Jeep seems intent on bringing the Wagoneer back in 2018. 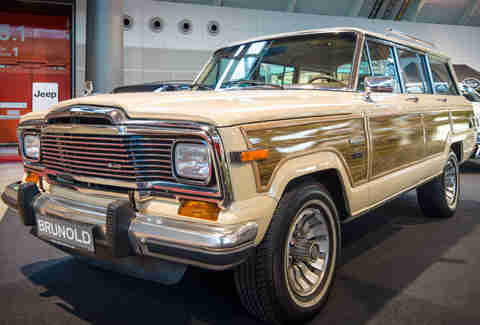 It's both a play on middle-age sentimentality and Millennials' “early onset nostalgia.” Chrysler wouldn't comment for this story, but the Wagoneer's likely return positions Jeep as a brand that embodies our current cultural moment as well as the first Wagoneers did theirs. The irony of all this is that the woody is by its nature fake, which means that for the second time in its storied life span, it will represent a cherished American ideal while at the same time exposing that ideal as bogus. It's a simulacrum: a representation of a representation. But this too is quintessentially American. A representation of a representation is what gave us the derivatives market, postmodern American fiction, and hip-hop. The story of the woody just happens to be the Ur story of America: having the ingenuity to take something old, call it new, figure out a way to mass produce it, and then sell it. It’s why Mark Zuckerberg could change the world by repackaging MySpace, and why Elvis could launch rock 'n' roll by rebranding Delta blues. The woody endures because it has done one better than Zuckerberg and Presley, though. It has spent its whole life optimistically, un-self-consciously preparing for its next iteration. We make gods of Michael Jackson and Steve Jobs for pulling that off. And neither of them ever had to work in metallic pea green. Paul Kix is the deputy editor of ESPN the Magazine. He has written for The New Yorker, New York magazine, and The Wall Street Journal. His first book, about an aristocratic French Resistance fighter who escaped from the Nazis three times, has been optioned by DreamWorks, and will be published in 2017. Follow him @paulkix.